On the left is a gluten & nut free Blueberry Banana Muffin and baby carrots. 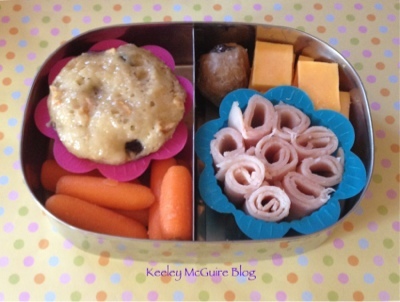 On the right are cheese slices, a cup with turkey bite size rollups, and a Bitty Bites cookie tucked to the left of the cheese. Every time I see muffins in your posts, I am always reminded of how much I really want to start making more muffins :) You my dear, are my muffin master :) HA!